I received a strong reply from one of the producers, Fred Foster, who lives in Cambodia who has a deep understanding of the form and the Wat Bo Troupe. I have known Fred for many years and have worked with him on several other productions of Cambodian dance and theater. He asked me to go, writing just that he felt my physical presence would be important to solving the issues of the presentation in New York. And so I went. Shadow puppetry is an ancient form of Cambodian theater that has its origins from the Province of Siem Reap. Cambodian Puppet Theater comprises three different forms. Large Shadow Puppets (Sbeik Thom), Small Shadow Puppets (Sbeik Toich) and Colored Puppets (Sbeik Phoa). All three incorporate two-dimensional figures hand cut from cow hide. The Large Shadow Puppet is the most formal and classical of the forms. Sbeik Thom (literally ‘large skin or leather’) always depicts scenes from the Reamker – the Cambodian version of the Ramayana. Shadow Puppetry is likely to have developed during the pre-Angkor period. Bas relief from 7th century temples in Kompong Thom feature woman puppeteers using figurines in a ceremony invoking Sarasvati, the goddess of Learning and the Arts. Sbeik Thom is considered a sacred theater form and as such, a performance is an act of worship. The entities revered in these performances include supernatural beings, deities, spirits and venerable teachers. Traditionally, Sbeik Thom took place either in rice fields or within pagoda compounds. It is often performed at ritual ceremonies and birthday ceremonies for monks and venerable members of society. The puppeteers, all trained in the Lakhaon Kaol form (classical male masked dance), manipulate the puppets from both behind and in front of the screen. The performance is accompanied by the classical Pin Peat orchestra made up of percussion and wind instruments plus two narrators. In 2005, Cambodian large shadow puppetry (Sbeik Thom) was awarded world patrimony status of intangible culture by UNESCO. As I wrote above, at first I didn't really understand why I really needed to go to Cambodia to see the puppets. I had seen another troupe perform on an earlier trip and I felt I knew what the issues were. I couldn't have been more wrong. When I was in Cambodia before, my experience of the puppets was in an indoor space. 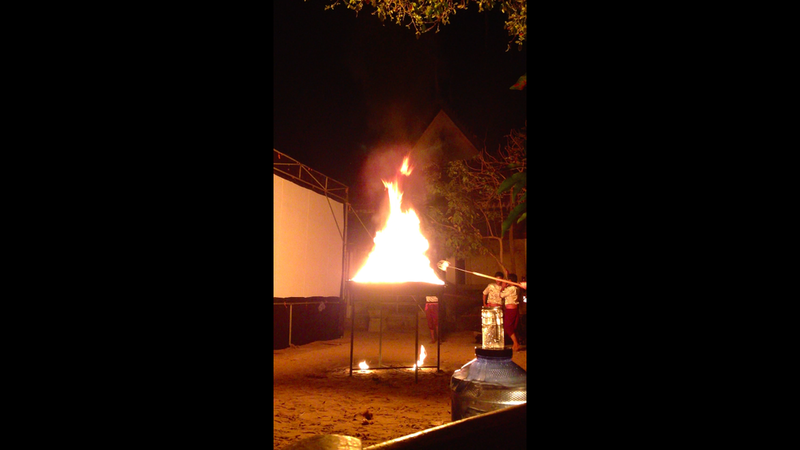 The event was lit with an electric floodlight because of the danger of having a bonfire indoors. The floodlight has become an accepted modification to this ancient form as it has moved to indoor spaces, even though the lighting of the fire, when the work is performed outdoors, is an essential and sacred part of every performance. The fire is visible from the front and gives the puppets and the event life. But being at Wat Bo, the home of the troupe, and experiencing the puppets in their traditional setting was transformative. I realized that the firelight was essential to the event. The fire is alive and it bestows that life onto the puppets. The dancing flames cause the shadows to be indeterminate, and the struggles of the characters become real through this dance of light and shadow. Another shot of the fire on its platform. Lighting the fire is an important, and even sacred, part of the event. The spacial relationship of the fire to the screen is also essential. Its proximity and scale is carefully measured and the dancers learn to use both to create magical fades in and out when the puppets are behind the screen. Here is a shot of the fire behind the small puppet form. Look how the scale of the fire allows for the sharp and soft shadows on the screen. Because of the size of the fire, a single source floodlight does not work in the same way, even when not considering the movement of the flames. The pathway to the event is lit by candles inside of banana leaf holders which are made each day. The elemental use of fire starts at the entrance to the performance space, literally leading the audience to the event. Another shot of the pathway. I had the direct experience of the contrast between the fire and the electric light because they use a floodlight for rehearsals. The floodlight is such a poor substitute for the fire. It is not the right color and more importantly, it is static. Also, because it is a smaller source in scale, the shadows are sharper and more defined. This change in light source for me completely changed the event. And it was when I saw these rehearsals I came to believe that it would be disservice to the nature of the form to present it with a floodlight like this in performance. But as we were scheduled to perform inside the Winter Garden in New York, where we could not have a real fire, I tried to come up with a way to simulate a fire with electric light. Here is the way the puppets look with the floodlight. It is harsh and a also colder white, static light. So I had an idea to create a video of the fire and put it onto a bright LED screen which would be the same size and proximity to the screen as the fire is in an outdoor performance. It definitely was not in any budget to get such a screen. I had been hired to design the lighting for this troupe, but the solution did not involve any "normal" theatrical lights. I had to make the argument about the essential nature of the fire to the producers back in New York and here is something interesting. The troupe themselves did not see this issue. Of course, they believed that the fire is an important part of the event, but they are willing to give it up when they perform indoors. To me, this unacceptably changed the nature of the event. The finished design and performance in New York. So, with a lot of help from other members of our team, we were able to come up with the money to include the video wall in the presentation, and I believe that we created an excellent version of the show, transforming a New York temple of marble and glass into a Cambodian temple of fire and puppets and music for a few hours each night of the festival. It took all of the skills of the Cambodian troupe and all of the skills of the American presenting team, working together with our diverse cultural backgrounds, to make it happen in a unique and I believe quite beautiful way. But it also changed the way that I think about my work. As designers, we're not here just to arrange the stage lights. We're here to find solutions to telling stories. In this case, the story of that fire needed to be told and the LED wall happened to be the way that we could tell it. Sometimes, others that you collaborate with won't even see what you're seeing, perhaps they are too close to the event or too far away from a possible solution. Designers are asked into the room as collaborators because we can focus on aspects of the storytelling event that others might overlook. Lighting designers live in a world of technology that gives us a unique insight into possible solutions that might not be apparent to others. It is through the careful balance of these two skills: looking at an entire event to find the essential visual framing story and having access and facility with a wide range of tools that gives us our place in the collaboration. Being able to communicate with our collaborators is just as important, for many times we are asking for people to make a big leap of faith in our sometimes quite expensive ideas.